At Viera East Veterinary Center, our approach to canine veterinary medicine revolves around a comprehensive, competent and compassionate care program, aimed at ensuring the highest quality of life for your dog. Perhaps the greatest measure of our success is found in our many happy patients and kind words from our clients. We value the long term relationship we have with many of our clients. Through good communication and trust, we have built so many great relationships with our clients which allows a great partnership to provide the best care for their dog. Some of the recent feedback from our clients can be found here. This dedication to service is why our practice continueally strives to become the best veterinary practice possible.We have taken extra steps to ensure we keep up with current advances in our field. Our veterinary clinic is among the top 15% of hospitals in the US that are accredited by the American Animal Hospital Association. 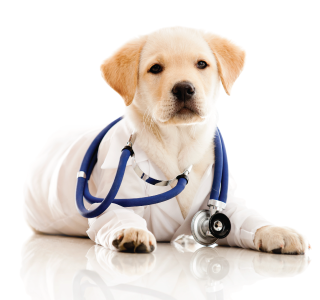 We understand that a canine veterinarian is only as good as his or her ability to successfully prevent, diagnose and treat whatever ailment your pet may be facing. Equally as important is our ability to listen and communicate well with owners to make sure they understand their dog's health concerns and how to make the best choices for their dog. This is why our hospital is capable of handling any procedure from preventive care, medical diagnosis to emergency surgery. Acupuncture: Utilizing effective eastern medicine to enhance the quality of your dog's life. Allergy Management: While not usually life threatening, allergies in dogs do cause discomfort and should be treated. Anesthesia: We have the facilities, equipment, medicine and knowledge to ensure your dog stays as safe as possible while under anesthesia. Bathing and Hygiene: Responsible dog ownership starts with a good bathing and hygiene regimen. Behavior Services: Your dog's behavior is not completely genetically inherent, but can be learned and unlearned with your commitment and our help. Boarding: We can ensure that your dog is well taken care of while you are away. Cancer Treatment: Our communicative, community approach to cancer treatment makes all the difference for you and your dog. Cardiology: Our first rate facilities, equipment and professional knowledge gets to the heart of your dog's health and wellness matters. From cardiac ultrasound to EKG we can manage all your dogs heart needs. Dental Care: Our knowledge and dental experience can help prevent and treat your dog's dental conditions. We are equiped to handle simple to complex extractions, oral lesions and periodontal disease. Dermatology: Our expertise means diagnosing and treating your dog's skin conditions before they become something more than skin deep. Diagnostic Imaging: Diagnostic imaging allows our veterinarians to diagnose illness, disease and other problems in order to prescribe the proper treatment. We have digital xray, digital ultrasound and digital dental xrays. Emergency Care: We are able to manage any emergency care your dog may need during our office hours. Flea & Tick: We employ various safe and effective preventive and flea & tick treatment methods for your dog's health and comfort. Heartworm Prevention: We are up to date in heartworm education and medical prevention, as well as treatment for your dog. Homeopathic and Nutraceutical: There is a lot more to health, wellness and medicine than prescription drugs and surgery, our veterinarians will make you aware of all appropriate treatment options, including homeopathic and nutraceutical remedies. Laboratory Tests: Our in-house laboratory testing services mean faster and more accurate diagnostics or treatment for your dog. Laser Therapy: We are able to customize our pain protocols to include laser therapy for arthritis, other inflammatory conditions and post operative pain control. Microchip ID: Our professional microchip ID services can help identify your dog in case he or she ever gets lost, stolen or separated from you. Nutrition: Our nutrition education, awareness and dietary intervention programs can help ensure your dog stays healthy and fit. Pain Management: We specialize in customized, effective and compassionate pain management for your dog regardless of age, ability or condition. Parasite Prevention and Treatment: Prevention and early detection are paramount to survival for some types of parasitic infections. Pregnancy: Our extensive experience can help your dog have a successful pregnancy, as well as a happy, healthy litter of puppies. Preventive Care: Our comprehensive preventive care program helps you make sure your dog remains healthy and well year round. Puppy Care: We will partner with you to make sure your puppy has the best care and you have all the information our need to care for your new family member. Senior Care: Our comprehensive senior care protocols and procedures helps you to help your dog age gracefully, healthily and happily. Semi-Annual Wellness Exams: A cornerstone of preventive care, semi-annual wellness exams are key to staying on top of chronic health issues and getting ahead of problems that may be developing. Spay or Neuter: Our refined pre surgical, surgical and post op care will provide your dog with the safest and most comfortable surgical procedure. Surgery: Our facilities, expert surgeons and technicians will make sure your dog is cared for before, during and after surgery. We are well equipped to take care of routine surgery on up to complex orthopedic cases. Vaccinations: Our veterinarians and techs will customize vaccination protocols that account for your dog's age, medical history, environment, travel habits and lifestyle. At Viera East Veterinary Center you will find that our veterinarians and staff place an emphasis on the importance of proper nutrition for all phases of your dog's life. Whether your dog is a puppy, adolescent, adult or senior, each stage of dog's life comes with some special nutritional considerations. Scheduling an appointment with one of our veterinarians is as easy as picking up the phone, or sending us an email. Our staff is here to help make your trip to the vet as easy as possible for you, and enjoyable your canine companion.